In the middle of winter holes are cut in the ice and thousands of Russian Orthodox Christians gather to submerge themselves in the freezing water to mark the festival of the Epiphany. The Baptism of Christ, also known as the Epiphany, is one of the 12 main Orthodox festivals, and it is traditionally celebrated on Jan. 19. 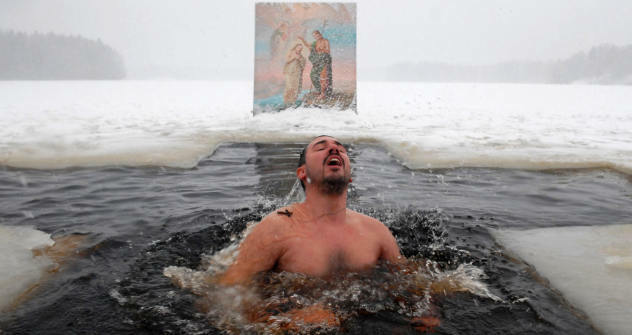 On the eve of the Epiphany, it is customary for Orthodox Christians to plunge into the frozen water. Priests and regular believers from many different churches go down to a lake or a river, where a hole has been cut into the ice in the shape of a cross. This opening in the ice is called a “jordan,” in honor of the holy River Jordan, in which Jesus was baptized. People climb down into the jordan on a small wooden ladder until they are half submerged, then they make the sign of the cross before fully submerging themselves in the water three times. In Russia the temperature tends to drop around the time of the Epiphany, and both believers and non-believers alike refer to this time of year as the “Epiphany frosts.” But despite the freezing temperatures, people believe that plunging into freezing waters at the Epiphany is not going to do you any harm, in fact, it is said to strengthen the body and improve the health. “You can even go in the water at -40ºC, because the whole process only takes about 5-6 minutes, and no organ in the human body is going to have time to get cold. When a person is in the cold water all his or her blood is redistributed around the body, and this is actually good for the health,” said Vladimir Grebenkin, president of the International Association for Winter Marathon Swimming. Those who are frightened or who are unable to submerge themselves in the water are told not to worry – there is nothing in the rules of the Orthodox Church saying that every good Christian has to bathe outdoors to mark the Epiphany. “This festival is mainly celebrated within the church itself at the Divine Liturgy. As far as the church is concerned, the most important thing is to take part in the celebrations and to share the joy of this day with those close to you, with your friends and family” said Georgy Roshchin, the deputy head of the Moscow Patriarchate’s Department of Church and Society Relations. This year, the Russian Ministry for Emergency Situations has approved 40 places in Moscow for Epiphany bathing, and every spot will have a warm changing room nearby. A plunge pool is even going to be built right in the center of Moscow on Revolution Square. In Moscow, alone an estimated 60,000 people are expected to take part in the sacrament. The winter plunge is just one of several Epiphany traditions: In the churches across the city, a service continues throughout the day, in which holy water is blessed by the priests. This water is then preserved in churchgoers’ homes until the next Epiphany. “If you drink a bit of this holy water every morning you can enhance your spiritual health. You only have to believe that the water will help heal your body and your spirit,” said Roshchin. Russian Orthodox Christians also call this festival the “Manifestation of God,” since according to the Gospels, all three part of the Holy Trinity were present in that moment: the voice of God the Father came down from the heavens, the Son of God was christened, and the Holy Spirit came down in the form of a dove. This festival is also known as the “Day of Enlightenment,” and the “Day of Lights” because people want to join the church are traditionally baptized on the eve of this festival – in essence, this is spiritual enlightenment.